Boise... A city nestled along the river where the desert softly meets the mountains... A city touched by four seasons but always with moderation...A city where your daytime golf game could be the warm up for your night time of skiing... A city given birth by hard working visionary pioneers, nurtured by their offspring and treasured by those who sustain her life today. 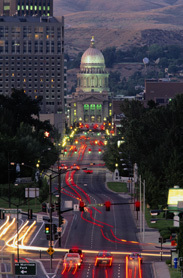 Idaho's capital is a small city with a big heart and a hometown feeling. Everything from steak to oysters. Oysters? Idaho? Yes, and damn good seafood! An upscale restaurant with outstanding steak and seafood. And make sure you have a 'baked' potato- this is Idaho! BitterCreek is Boise's only European style Alehouse. It offers a Northwest American focus featuring high quality boutique beers from 20 microbreweries along with imported craft ales. Pub style grill, with an original twist, serves lunch and dinner 7 days a week. Welcome to Café Olé! It has been voted "best appetizer," "best entrée," and "best dessert" for the "Bite of Boise." Café Olé has also won several times for the "Best of the Best" that is held every year. Boise River Tours provides half-day urban nature rafting tours of the tranquil and beautiful Boise River in the west Boise/ Eagle area. As you float along your guide will identify and discuss the different wildflowers, trees, shrubs, birds and insects that make the river environment their home. The tours are relaxing, educational, entertaining and suitable for all age groups. They also provide a light snack as part of every tour. Founded in 1907, the Idaho State Historical Museum is Idaho's biggest and most frequented museum. Collections at the museum chart the history of Idaho from prehistoric times to the present, with sections on the fur trade, the gold rush, and the pioneer settlement. The museum also features exhibits describing the history of the Native American, Chinese and Basque populations in the area. Bogus Basin is located 30 minutes from downtown Boise and features a high speed quad, a ski-in lodge, rentals and two restaurants. Call the snow phone at 1-800-696-4511 for conditions. The Idaho Military History Museum features displays about the early days of the Idaho National Guard, World War I, Gowen Field during World War II and the war in Vietnam. Minor League Baseball - Affiliated with the Chicago Cubs. >>Search Pollstar for live music in Boise!